New Year, New You? Start here. He was quoting Deuteronomy 8:3 in response to the devil's temptation, after forty days of fasting, to turn stones into something to eat. [God] humbled you, causing you to hunger and then feeding you with manna, which neither you nor your ancestors had known, to teach you that man does not live on bread alone but on every word that comes from the mouth of the Lord. And now, a question for you: Who are you? Are you a number on a scale? A checked-off to-do list? A physical accomplishment? How your kids behave? Your salary? Your degree(s)? Your leadership position? How clean your house is? Your relationship to someone else? The neighborhood you live in? The car you drive? Sisters and brothers, we need to give all this up! Who you ARE is none of these things! And I don't know about you, but the harder I try to find my identity in any of the above, the more miserable and dissatisfied I become. Our souls were not made to be satisfied by things, accomplishments, physical appearance, or relationships. Our souls will find their satisfaction and peace only in the Prince of Peace, Jesus Christ, the Son of God, who came into the world to save His people from their sins. And the place we learn about who we really are and how to become what He desire us to be is from our Creator in His Word. 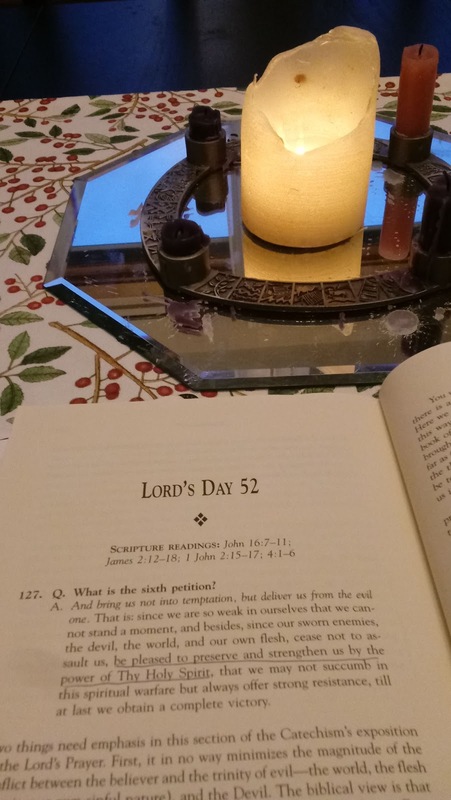 to feast on the Word of God? Because according to Him, we need His Word as much as we need bread to survive! If Jesus needed the Word to refute the evil one, how much more do we? Filling up on a diet that daily reminds us that we are sons and daughters of the King of kings, who have an eternal inheritance that can never spoil, perish or fade, who are indwelt by the Spirit of God who will equip and enable us to resist the temptations of the world, flesh, and devil, who are loved with an everlasting love by which our souls were made to be satisfied, will protect us form trying to hang our hope on one or more of the idols I listed above. The Word that reminds us that we are in much greater trouble that we ever thought, but that God's rescue plan is beyond what our wildest dreams could fathom. Feasting on the Word of God keeps us in our place, not in a humiliating way, but in a humbling one that will cause us to wonder and worship the God who formed, saved, and sustains us and to desire to extend mercy and love to others, for we have known a love that must be shared. You will even find you love you more, when you look at yourself through God's lens, not the world's distorted mirror. Let's neither trust in useless idols to define us, nor invent a god in our head who is not God at all; instead, let's dive into His Word where He reveals Himself so we can know Him. He has done this, and it should leave us astonished! Why God? Why? Well, 2019 is the year for you to dive into His Word and find out! The transformation He offers is of far greater value than any resolution can offer you this year. PS: I'll share some resource ideas later this week, if you need some ideas of where to begin! I am thankful not to be feeling this year like I did when I wrote this in 2016, but I want to offer it again as a gift to those of you who may be ready to throw in the towel in 2018. Fight on; don't give up! and repost today for your edification as Advent 2018 begins. 'Tis the season! Stockings are hung, halls are decked, carols are playing (everywhere you go!) It is a season of wonder, of joy, of hope, of delight. And according to Macy's we should Believe. Yes, surely it has something to do with the fun of Santa Claus making his yearly appearance (without being seen!) in the homes of those with little ones. But for Christians, people often referred to as "believers," that word and this season offer so much more. These weeks leading up to Christmas are a time of wonder, joy, hope, and delight because we believe not in one we outgrow, but rather in One who is eternal, all-knowing, ever-present, and Almighty. The One who came on that first lonely Christmas night so many years ago. Christmas is no blip on the screens of our lives, to be momentarily enjoyed and immediately forgotten. Christmas is, rather, a major "we interrupt this program" service announcement than changed the course of human history. God, set in motion events that would bring real justice and real peace between man and Himself. Christmas looks toward Easter and points to eternity. Our culture invites us to believe in something during this magical season, but offers no real consensus on what. And it leaves most of us disappointed on Dec. 26 when the fun ends, the decorations are down, the gifts are opened, and the parties are over. But God invites us to believe in Him, the only wise God who offers a living hope, a new life, the true light that is the light of men and does not fade when the bright decorations come down. 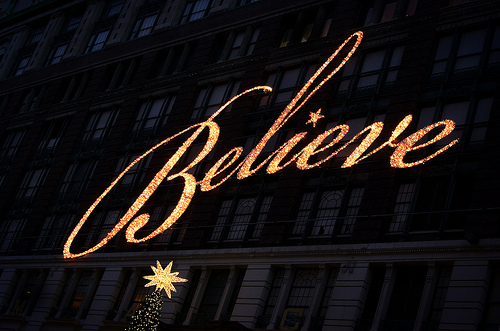 Christmas is an invitation to believe. Thanks for the reminder, Macy's! All the longings of creation are met in Him.